Successfully Added LED Color Changing Shower Head (Square) to your Shopping Cart. Great for new installations or retrofitting into existing showers, this LED Color Changing Shower Head (Square Edition) can be installed and working in just a few short minutes. Ever since we introduced the first version in 2008, these have become an instant e-tailing best seller. 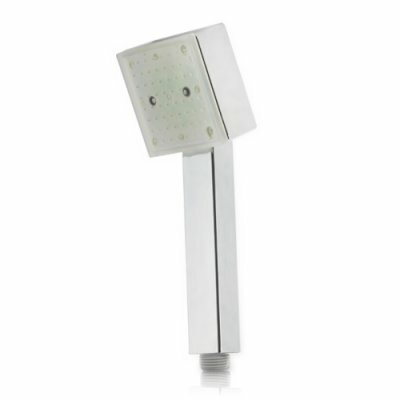 Now, we are happy to give you a new square head version of the super popular LED Color Changing Shower Head. Who needs a color changing LED shower head? Everyone, or course! Why shower under one color when you can have a constant color show? Have the lights randomly fade from one color to another or even quickly jumpshow between colors. Of course, you can always just leave it in its standard operating mode as an RGB temperature detecting shower head, the choice is yours!! Note: This great new product is available with Factory direct low china wholesale price and we'll even dropship it to your customer. As always, it is in stock in our warehouse and is available for immediate shipment. Click "add to cart" to order yours today. The water current flowing through the shower head powers the LED's. That is why when you install this shower head you might notice a slight decrease in the water pressure versus your previous non-LED shower head.